In this March 28, 2018, file photo, a North Atlantic right whale feeds on the surface of Cape Cod bay off the coast of Plymouth, Mass. The first North Atlantic right whale of the season has been spotted in waters off eastern Cape Breton amid concerns from fishermen that measures meant to protect the endangered mammals have led to increased fishing activity and greater risk. Fisheries officials said late Tuesday that one of their surveillance flights had reported a right whale sighting in Canadian waters after it likely transited from wintering grounds off the U.S. seaboard. “The whale was sighted swimming east of Cape Breton island,” the department said in a news release. Prior to the department’s update, six associations representing the Southern Gulf of St. Lawrence Mid Shore Fleet, said statistics for the first 10 days of the fishery show the number of pots fished has increased by over 50 per cent compared to 2016, while the total catch landed is down slightly at 4,354 tonnes compared to 4,964 tonnes in 2016. The groups said that indicates a rush to catch quota in light of a decision by the Department of Fisheries and Oceans to shut down access to two major snow crab concentrations in fishing Area 12. The midshore fleet says that’s forced 130 fishermen into “already exploited” fishing grounds outside the closed area. “What is happening that you are diverting the effort outside of that zone and you are retarding the catch of the crab,” Robert Hache, director-general of the Acadian Crabbers Association, said in an interview. The snow crab groups said fishermen are now competing to catch an extra 20 to 30 per cent of the total allowable catch to compensate for their lack of access to the closed area. As of Tuesday, the federal department said 6,319 tonnes had been landed by traditional, First Nations and new access fleets in designated areas of Canadian waters including the Gulf. Hache said there had been no right whale sightings in the Gulf since the season began May 1, adding that the large marine mammals don’t generally arrive in the area until early to mid-June. The snow crab season ends June 30. Hache said it would make more sense to have more widespread fishing during the month of May, to the benefit of fishermen and the whales. 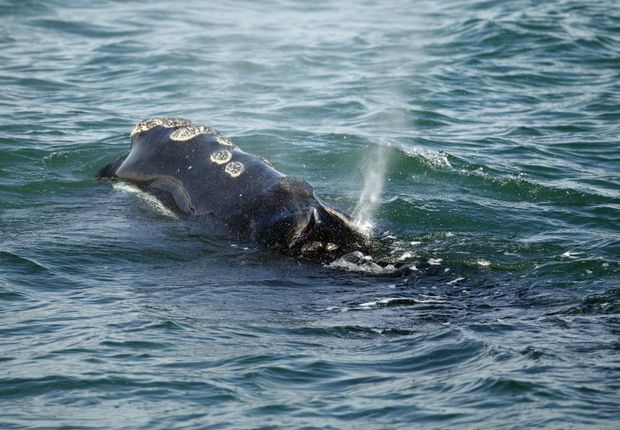 He stressed fishermen aren’t opposed to measures designed to protect right whales. “If we could have fished there (restricted areas) for the past two weeks . . . we would have already probably doubled the landings that we have at this time, which would have meant the fishery would have finished earlier and the traps would have been taken out of the water earlier,” he said. As things stand, Hache said there’s an increased likelihood of the whales arriving when many pots will still be in the water, thus concentrating the risk. The federal government announced in March that it was shifting the snow crab season and cutting the number of traps in the water as part of an attempt to protect right whales, following a year that claimed 18 of the critically endangered species. The total population is estimated to have dropped to about 450. Tests showed that most of the 12 animals found in Canadian waters had become tangled in fishing gear or had been struck by boats. The snow crab catch limit this year is set at just over 20,000 tonnes for about 400 boats from New Brunswick, Nova Scotia, P.E.I., and Quebec.